I was sceptical at first, but a commenter called ‘dog in the street’ first raised it on this thread about Lutfur Rahman’s mayoral advisers here. After finally getting it confirmed through a council source (Takki Sulaiman’s press office refused to comment), I wrote this in the Sunday Express’s Crossbencher diary column at the weekend. OH, HOW the mighty are fallen. Labour’s former Justice and later Communities minister Shahid Malik, who lost his seat in Dewsbury in 2010 after it emerged he had claimed £730 on expenses for a massage chair and another £2,600 on a home cinema system, is now scrounging for work at Britain’s supposedly cash-starved councils. Crossbencher has discovered he is working as an official “equalities” adviser for the controversial Independent mayor of Tower Hamlets, in east London, where he is being paid £200 a day. When we asked the council how he was appointed and for examples of his work, it refused to say, refusing even to confirm he existed. So, there we are. 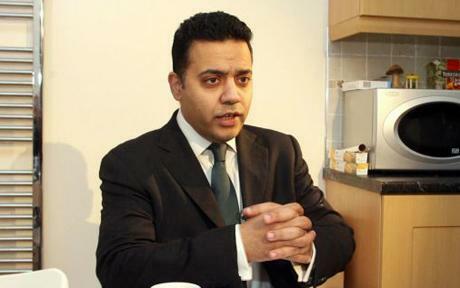 An ex-Labour minister is advising Lutfur for one day a week on £200. If someone can find the advert placed for this job, can they please send it me because I’m curious. I’m also puzzled why a council that prides itself on its equalities issues – and which has an army of staff dealing with such matters – feels it needs an extra body. Malik used to work for the Commission for Racial Equality and was cleared of any wrongdoing with his expenses. We had one of those rare outbreaks of co-operation between the Lutfur Rahman Independents and Labour at the full council meeting last night when the 2012/3 budget went through first time but only after a series of Labour amendments were accepted by the Mayor. I’ll blog more about that later but there was one incident worth mentioning here now: an attempt by the Independents to cut the allowance for leader of the second largest political group – who just happens to be the borough’s best muck-finder, Tory Peter Golds. The way this seemed to come about was actually pretty pathetic. After Peter had raised issues of probity within the council chamber and dared to criticise a highly paid officer for not standing up to the Nolan principles of transparency, he was targeted by Lutfur’s cabinet. While this rowing was taking place, Lutfur’s mayoral advisers in the public gallery were getting rather excited…you know, in the way that political anoraks do in such a bubble. So much so, that the meeting stopped for a couple of seconds when there was a loud thud: Lutfur’s chief of staff Murziline Parchment had actually tripped up as she ran to confer with the cabinet member for finance Cllr Alibor Choudhury. Well, what Alibor, who must have spent months poring over documents to come up with a £1bn budget, was proposing was to use half an hour of the council meeting to debate a £5,000 saving. He wanted to halve Peter’s extra allowance from £10,000 to about £5,000. Petty and pathetic. And Labour sided with the Tories to boot it out. The reason I mention this here is because if they were genuinely concerned about saving money they wouldn’t be about to waste far more of our cash on the council’s most lucrative position. When former chief executive Kevan Collins resigned last year, Aman Dalvi stepped into his shoes as the interim boss. I raised some concerns about his track record, but from what I’ve heard, he’s been doing a good job. But will he last? …just four of the many attractions of being chief executive in Tower Hamlets, the high-performing urban borough with astonishing diversity, challenges, ideas and energy. It is a borough where local decisions – on housing, regeneration, jobs, education and the environment – resonate across the national political landscape. It presents a truly unique opportunity for an experienced chief executive with the character, resilience and drive to deliver on uncompromising and ambitious priorities. For further information and a confidential discussion please contact our retained consultants at Penna: Julie Towers on 07764 791 736 (julie.towers@penna.com) or Jonathan Swain on 07500 961 727 (jonathan.swain@penna.com). To apply please send a comprehensive CV including referees and salary expectations along with a detailed covering letter setting out how you meet the specification and what experience you can bring to this role. Closing date: 27th February 2012. The job description and person specification are here and here. You’ll notice that it doesn’t specify the salary range. But because I was interested in maybe applying for it myself, of course, I rang Penna this morning…the salary range is between £165,000 and £194,000 a year, including London weighting and travel allowance. Now, recruitment consultants are normally paid a commission of about 30 per cent of the salary for the position they’re filling, so that works out at some £60,000 down the drain for what could be a temporary position. I suspect that Penna will even get this cash if Aman Dalvi is appointed, which would be absurd. Perhaps Alibor and the rest of Lutfur’s shipped-in advisers should start looking at the bigger picture before playing playground politics over £5,000. Lutfur then refers to Thursday’s Evening Standard spread by journalist Stephen Robinson in which Peter highlights the homophobic abuse he has been subjected to, both in the council chamber and in the borough at large. On the streets of Tower Hamlets, councillor Peter Golds tends to stick out. For a start, he is a contentedly “out” gay man. In what is now a heavily Asian borough, he is of Jewish origin, and even more unusually, in a neighbourhood where few are proud to be Tory, he is a strident Conservative. These factors combine so that when Cllr Golds stands up to speak in the council chamber, things can turn very ugly in the public gallery. “I get the hissing, the calls of ‘poofter’, they shout ‘Zionist scum’ at me,” he says, sitting in his office at the Town Hall. This sort of treatment can be equally disturbing for a lesbian Labour councillor, who is subjected to other strange heckling. More shocking still than these eruptions from the public benches is that this behaviour is seemingly tolerated, even though Tower Hamlets’s first directly elected mayor, Lutfur Rahman, says he is relentlessly intolerant of sexist and racist bigotry. As Golds said in a formal complaint to the borough police commander, were white skinheads observed yelling abuse at Muslim east Londoners, it would not be tolerated. The worst of the abuse occurred shortly after Rahman’s election in October 2010 but Golds says it continues to this day. Those with even a passing acquaintance of Tower Hamlets politics will know that myself and Cllr Golds, the leader of the Conservative group, are regularly at loggerheads with each other. I don’t agree with much of Cllr Golds’ politics, but I do respect the tenacity and conviction with which he pursues them. I was alarmed therefore to read in the Evening Standard that Cllr Golds had been subject to regular homophobic abuse at Tower Hamlets council events. I had been aware of alleged comments from a member of the public on the night of the February council meeting last year. But I was unaware that the problem of homophobia at council meetings was as serious as Cllr Golds intimated to the Evening Standard journalist. Tower Hamlets Council is determined to stamp down hard on homophobia, and any incidents of hate crime. That’s why I have decided to contact the borough commander to request that the police conduct an investigation into the allegations of homophobia at council meetings, or related events. I am proud that Tower Hamlets Council came sixteenth – as well as being the best London borough and the second best local authority in the UK – in the Stonewall Top 100 Employers 2012, published last week which showcases Britain’s best employers for lesbian, gay and bisexual staff. However, there is still much work to be done in overcoming homophobia. I look forward to the police response. I will be encouraging the fullest cooperation with their investigation when it commences. I’m not quite sure what to make about this. Maybe it’s the cynic in me but I wonder if Lutfur is asking us to read between the lines. Does he genuinely believe that Peter has been called “Zionist scum” in the chamber? Is he asking Peter to put that in a police statement? Is he asking for the police to listen to the audio tapes of the latest council meetings? It’s just curious that he never called in the police when his self-styled financial backer Shiraj Haque was alleged to have hurled hateful abuse last year. As Lutfur says, he was aware of it then but did nothing. “One Mayor, one borough, he will do anything he likes”; “Peter [Golds], get out of the borough, you can rent one of my flats”; “Peter, are you going on a honeymoon with Jim Fitzpatrick?”; and heckling during a discussion on investment strategies, “I can give you a better rate of interest if you invest in me”. 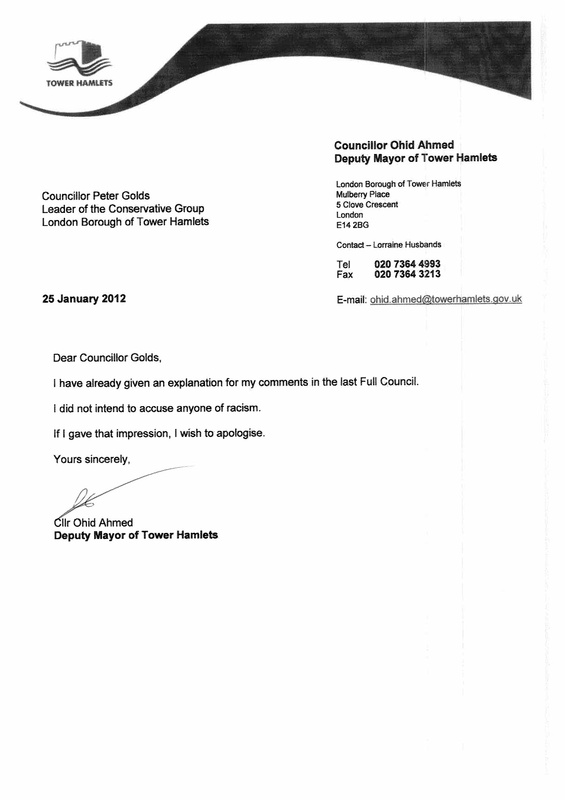 So now we know why Mayor Lutfur Rahman of Tower Hamlets repeatedly refused to answer questions from councillors at the last full council meeting. It wasn’t just because forcing him to speak would infringe his human rights (as John Williams, the council’s head of democratic services, asserted), but it was because he has assembled such a crack-team of latter day Einsteins that they can do the talking for him. Well, anyway, these are the views of one of those modest intellectual leviathans, the finger-wagging Cllr Rabina Khan and ex-SWP stalwart Cllr Rania Khan. Housing Benefit changes will have a profound impact on our residents and it will lead to some having to leave the borough because the housing allowance will not cover their full rent. Can the Mayor inform the Council the number of meetings he has had with the Minister responsible for these changes to highlight the impact on residents of Tower Hamlets? As no answer has been given, I shall assume there was no meeting. I do not feel it is appropriate for the Mayor to sit there smiling and not answer the questions. If he does not want to answer he can take a break and leave the Council Chamber. The Prime Minister and Mayor of London answer questions personally, why is the Mayor refusing to do so? The Mayor and I are extremely concerned by the changes to housing benefit. Almost a year ago as Cabinet Member for Housing I presented a motion to this Council which laid a marker down on this administration’s views on the Coalition’s appalling measures. We are already seeing the impact of these changes on families in the borough. Some families are already reluctant to move to larger homes due to the housing allowance cap and are choosing to stay in overcrowded circumstances. These changes will impact across all the services in the council as well as our partner organisations. This is why I have asked our central research team to coordinate a high level and innovative group to collate the impact this is having across all Council and partner services. I have also had several meetings with organisations such as Shelter, TELCO and Z2K to discuss a coordinated response. I have also ensured that the Tenant’s Federation are fully aware of the changes and have held workshops with them. Next month we are holding a congress with key Partners, including RSLs, the Police, Schools, the Third Sector and to look at the impact of this in a holistic way and plan ways we can combat the changes and mitigate the impact to our residents. This process is to build a coalition of concerned individuals and institutions, who care deeply about the residents of this borough. We will collect a solid evidence base of the impact across the borough. We know that millionaire ministers are responsible for pushing through these reforms. They have no idea how most people in this country live. In fact Lord Freud, the minister responsible for benefit change, isn’t even elected. We will have far more of an impact working together. We will demonstrate that individuals and organisations from across this borough oppose these vicious cuts. And we do so, not simply on a whim, but because they are damaging our community and our residents. It is not the case that the Mayor is unwilling to provide answers to the questions asked at Full Council. At Full Council meetings, the Mayor’s approach has always been to deliver a verbal statement updating members on the progress his administration is making, and then allow his cabinet members to answer questions specific to their portfolios. We are a strong cabinet, who invest long hours, remarkable intellect and hard work dealing with issues in minute detail on a day to day basis. We are well placed and will continue to answer questions specific to our portfolios. Can the Mayor inform the Council on whether the Rich Mix Centre has repaid its £850,000 short-term loan, as agreed by Michael Keith when he was Council Leader? Will the Mayor answer my question? The Legal Department is currently working on this matter, however no repayment has been made as of yet. At Full Council meetings, the Mayor’s approach has always been to deliver a verbal statement updating members on the progress of his administration, and then allow cabinet members to answer questions specific to our portfolios. I must have been missing something all these years. Rofique’s intellect was such that at an Olympics planning committee meeting some years ago he managed to contribute not a single word in seven hours…and then later tell me it was because he had toothache. Does anyone else have any evidence of hidden genius? Answers on a postcard, please….